Beautiful Pom-Poms made easy! 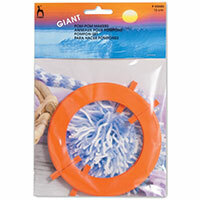 Contains 2 Pom-Pom makers size 2 1/2 inch & 3 3/8 inch (65 & 85 mm) in diameter and instructions. 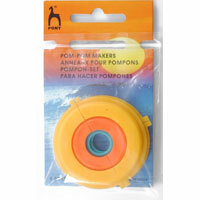 I was amazed how easy it was to use and how quick I got a good shape Pom-Pom. Perfect for decorating scarves, gloves, sweaters and other accessories. They make fabulous Christmas Baubles! Free pattern available to download for Pom Pom Scarves, see related items below. Free with purchase of a Clover Pom Pom Maker.